Fortunately for the family business, Tabor did not mess it up. 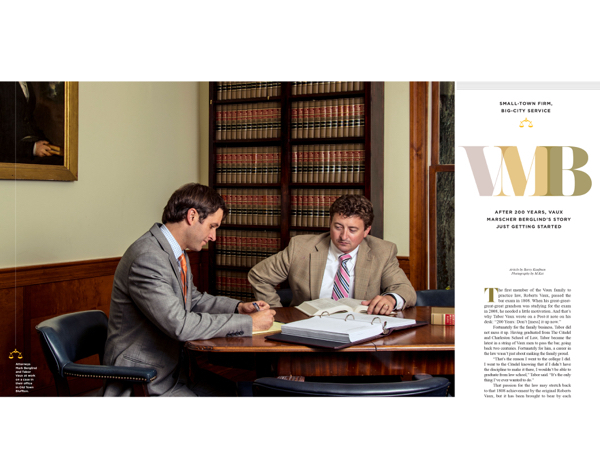 Having graduated from The Citadel and Charleston School of Law, Tabor became the latest in a string of Vaux men to pass the bar, going back two centuries. Fortunately for him, a career in the law wasn’t just about making the family proud. That passion for the law may stretch back to that 1808 achievement by the original Roberts Vaux, but it has been brought to bear by each generation in turn. Eventually, another Roberts Vaux would open his own firm in 1973, establishing the first in the region under the guiding principle that even in small-town Bluffton, everyone should have access to competent legal representation. Tabor is the latest Vaux in the firm, having joined in 2012 after a few years in the 14th judicial circuit’s solicitor’s office. Thanks, in part, to that long family history, the name Vaux Marscher Berglind is synonymous with legal representation all over the Lowcountry from its charming circa-1902 cottage along May River Road. But don’t be fooled by its rustic façade—Vaux Marscher Berglind is a powerhouse law firm. For example, Tabor focuses his practice on personal injury law. His father continues in general litigation and real estate, among other areas. Other attorneys at the firm focus on areas such as real estate, estate planning or criminal defense, among a dozen other areas of practice. The first of his family to practice law (“I was raised by doctors,” he said), Berglind realized his passion for the legal world early on. “I knew by junior year in high school that’s what I wanted to do,” he said. “It led me to Clemson, where I majored in political science. With both lawyers focusing on personal injury, and with the full staff at Vaux Marscher Berglind dedicating themselves to a wide array of legal specialties, it’s clear that this small-town law firm carries big city appeal. Vaux Marscher Berglind, PA is located at 1251 May River Rd., Bluffton. 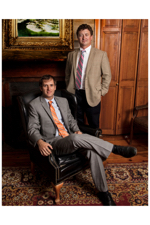 As their website says, Vaux Marscher Berglind, P.A., are the local attorneys offering big-firm services. Their offices may be in Old Town, but their 100 years of combined experience assures two things: first, that Roberts Vaux’s original mission to provide everyone with competent legal representation is very much alive and well; second, that in the hands of this up-and-coming generation of young attorneys, the promise of that Post-it note has not been forgotten. Vaux Marscher Berglind, PA is located at 1251 May River Rd., Bluffton. For more information, visit vaux-marscher.com or call (843) 757-2888.